If you are like me and work in an office, you probably have a drawer dedicated to snacks and quick fix meals for those times you just can't get away from the desk for lunch, don't really like what you brought, or are working late and don't want another night of Chinese delivery. I like to keep fairly healthy meals on hand (I said FAIRLY healthy). For example, my drawer currently contains one container of Healthy Choice Minestrone soup, a box of spring vegetable Cup of Soup, packets of instant oatmeal and Cream of Wheat, a box of granola to add to yogurt or snack from the box on, some lightly salted almonds, a box of multi-grain crackers and three Jif to Go's. One of the things I really like to have on hand is the Starkist Lunch to Go. My only complaint about these is there aren't enough crackers to match the amount of tuna. So, I always have to use two or three extra crackers from my stash (thus the box of mulit-grain crackers). A few weeks ago, I was restocking my drawer at the store and I saw the Bumblebee version of the Lunch to Go and decided to give them a whirl. I picked up a regular and a fat-free version. Besides, I had a coupon for them making them significantly cheaper than the Sunkist version. Frankly horrified and absolutely disgusted by the product. I can honestly say I don't think since I tried Rocky Mountain Oysters have I ever put anything as vile tasting in my mouth. The "tuna salad" tasted so chemical, overly sweet and oily I actually gagged. Not to mention who puts carrots in their tuna salad? I spit it out in a napkin and immediately looked at the good by date to make sure it hadn't expired. It wasn't expired, it was just nasty. I saved the crackers, tossed the disgusting tuna salad in the trash can in the kitchen area, and went to my desk drawer and got out my last Starkist Lunch to Go. I happily enjoyed lunch. 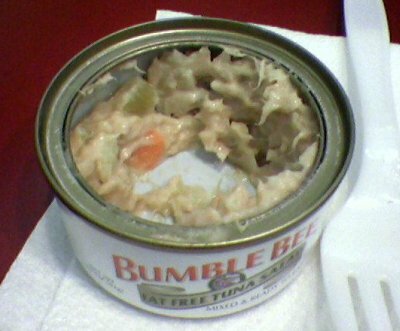 I'm not sure what to do with the other Bumblebee Tuna Salad meal. I know I should probably give the Bumblebee versions another try because maybe it was just the fat free version that was nasty. But, somehow I think it will find its way out in the communal food area of the office kitchen for anyone who is brave. What do you keep in your desk drawer for lunch?